Acute rhinosinusitis (sinusitis) is a common condition, affecting 8-15% of the population at any one time. It is characterised by inflammation of the mucosal linings of the nasal passage and paranasal sinuses. Most commonly caused by rhinoviruses and coronaviruses. Post-viral rhinosinusitis – residual mucosal inflammation following a viral infection that produces ongoing symptoms. Acute rhinosinusitis is distinguished from chronic rhinosinusitis by the duration of symptoms. Symptoms lasting less than 12 weeks are classified as acute rhinosinusitis. Episodes are more common in the winter months. Symptoms that may suggest a bacterial cause include severe local pain, discoloured discharge, fever, or worsening after an initial improvement (post-viral). Viral upper respiratory tract infection – may include a component of viral ARS. However, viral URTIs are more common and symptoms tend to improve with symptomatic treatment within 3-5 days. Allergic rhinitis – causes inflammation of the nasal mucosa without infection, and should be suspected where there is a history of allergy or atopy. Symptoms include other allergic features, such as watery eyes, but mucopurulent discharge or loss of sense of smell are unlikely with this diagnosis. Facial pain syndromes (e.g. migraines, cluster headaches, mid-segment facial pain) – a common diagnosis in patients referred to ENT departments for facial pain. The absence of other nasal symptoms make a non-sinogenic cause more likely, as do endoscopic or radiological findings of normal nasal mucosa. The diagnosis of acute rhinosinusitis is typically made on clinical symptoms alone. Imaging, such as a CT scan (Fig. 2), may be required if complications are suspected. Skin prick testing for allergy might be appropriate in patients with recurrent episodes and symptoms suggested of allergic rhinitis. Figure 2 – CT scan demonstrating left maxillary acute rhinosinusitis. Most cases of acute rhinosinusitis cases can be managed in the community, and do not require treatment with antibiotics. For patient with symptoms up to 5 days (or >5 days but improving), symptomatic treatment with analgesia and nasal decongestants will suffice. For cases of >10 days or worsening after 5 days, topical nasal steroids and oral antibiotics are indicated. If there is no improvement after 7-14 days of treatment or the presence of red-flag symptoms, referral to ENT services should be considered. Eye signs, including periorbital swelling or erythema, displaced globe, visual changes, ophthalmoplegia. 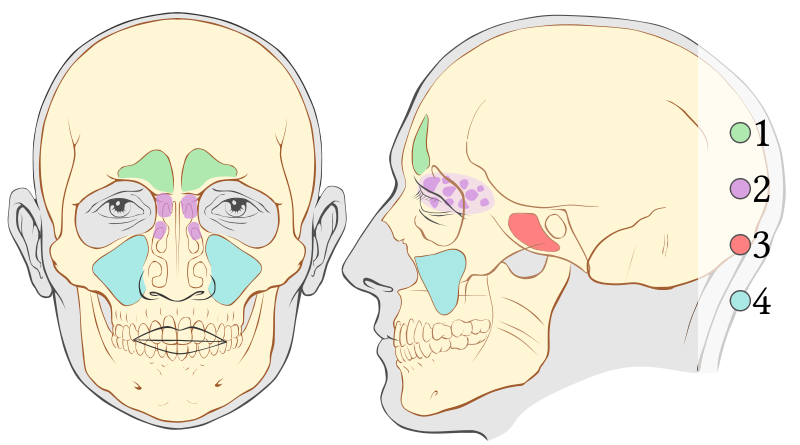 Severe unilateral headache, bilateral frontal headache, or frontal swelling. Neurological signs or reduced conscious level. An ENT specialist will perform nasal endoscopy, to identify any abnormal anatomy or pathology. A culture of any nasal discharge may be warranted for atypical infections. 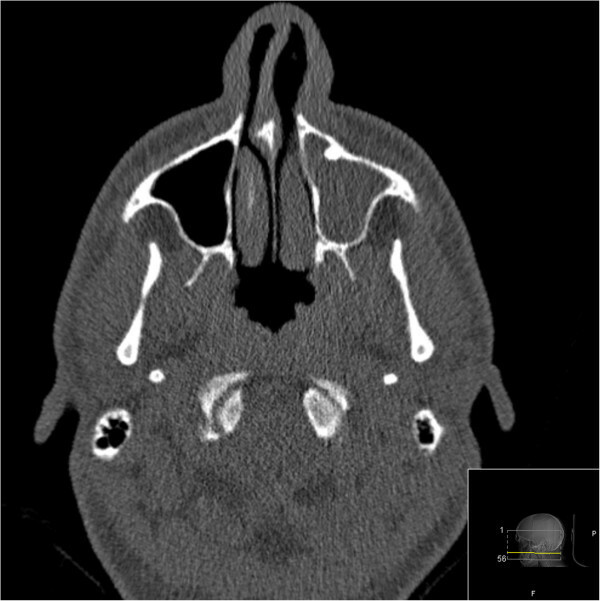 A CT scan of the paranasal sinuses would show the extent of the disease, as well as identifying complications and any underlying anatomical abnormalities. For severe infections or complications, admission might be necessary for treatment with oral steroids, intravenous antibiotics, and the consideration of surgery. Figure 3 – Pott’s puffy tumour. 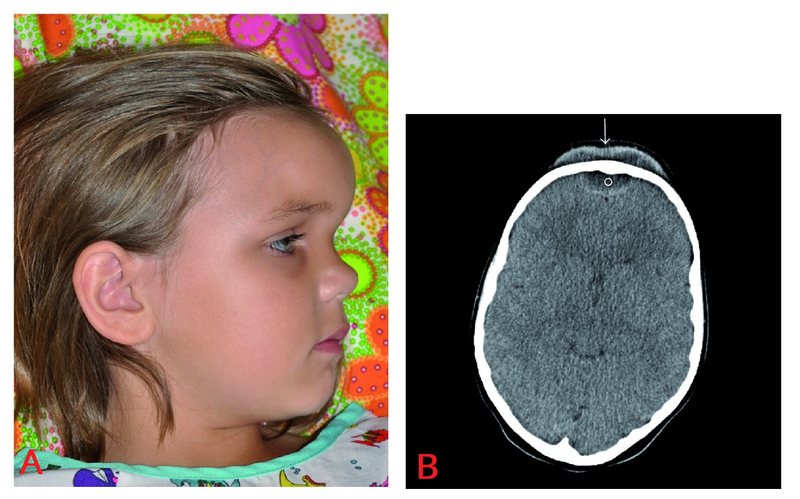 A) Child demonstrating a notable amount of fullness over the area corresponding to the frontal sinus. B) Axial CT of the brain demonstrating subperiosteal (arrow) and epidural abscesses (circle). Which of the following is not a typical bacteria causing acute rhinosinusitis? Which of the following symptoms is not included in the criteria for diagnosis of acute rhinosinusitis? Which of the following is a red flag symptom of acute rhinosinusitis?